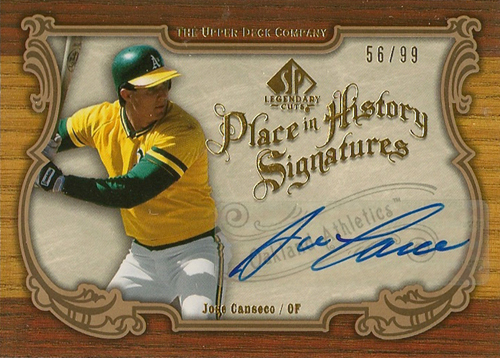 In case you missed the news this week, the Upper Deck Company announced that it had signed a non-exclusive autograph deal with former MLB Most Valuable Player, Jose Canseco. While this may not be the most popular move by the Carlsbad, California company, it proves that it is giving collectors exactly what they want. To fully appreciate this Blog entry, you should know that I grew up idolizing Jose. Being an only child in a single-parent home, to me Jose was much more than a guy who could crush 500-foot home runs and drive fast cars. He was the father I never had and the man I hoped to become one day. When news broke, by Jose himself, that he had “cheated” to reach his career milestones, it was a tough blow for me. Unlike some, I didn’t stand up to support my hero. I simply tuned out. I stopped watching baseball and didn’t turn on another game for five long years. It’s 2009 and not only have I begun watching baseball again; I’ve actually learned to forgive Canseco and others who have let me down (Mark McGwire, Barry Bonds, etc.). Do I still look at Jose in the same light? Absolutely not. He lived a lie his entire career and then snitched out his friends because baseball wouldn’t let him back in to reach 500 career home runs. Despite all this, Jose is still extremely popular among many in the Hobby. There is a large group of collectors dedicated to Canseco’s cards and memorabilia and to say they have been anxiously waiting for this day would be a huge understatement. Earlier this year, I noticed that a Canseco card on eBay – a 1989 Upper Deck Buyback base card – sold for nearly $50. 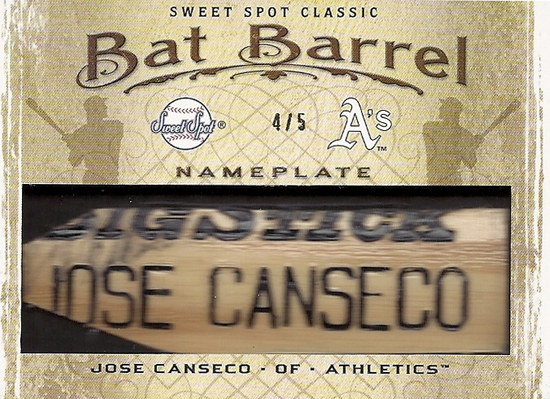 Just last week collectors were shocked to find a real Jose Canseco card inside of Upper Deck’s 2009 Sweet Spot Baseball release. It is a rare, game-used bat barrel insert numbered to five and despite all the hate Jose receives among sports fans and collectors alike, it very quietly sold for more than $300 dollars. This signing has to give hope to those collectors of players like Bonds, McGwire, Sammy Sosa and others. Those guys have had to walk away from collecting or go back in time to find cards from the past after the card industry started shunning any former player who was caught or suspected of cheating. Today I can say that Upper Deck truly is the collector’s choice. Here’s hoping we see a card 20-plus years in the making; a Bash Brothers dual autograph. If Upper Deck can produce a limited-edition, dual-autograph beauty featuring McGwire and Canseco, it could be the surprise hit of 2010. Mario Alejandro is a long-time baseball fan who runs the online sports blog called Wax Heaven. You can find more card-related commentary and news on the premier sports cards blog www.waxheaven.com.